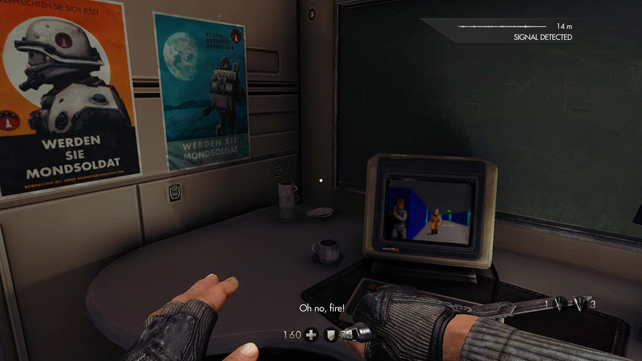 It’s been 33 years since the first Wolfenstein game appeared on the Apple II, and we’ve seen 8 iterations over the years that have taken it from a 2D stealth game and into the well known 3D FPS that comes to mind whenever someone utters the name. The 9th version of the game is now with us, and ticks the boxes of the recent reboot trend – bigger, prettier and more story driven. 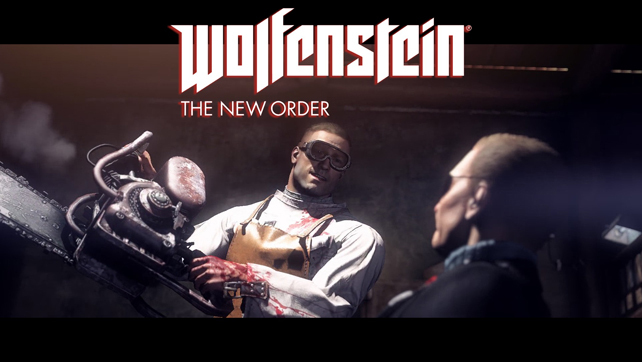 Is Wolfenstein: The New Order a return to its roots, or has it been transplanted into a new form entirely? Starting in 1946, you take to the controls of all round badass B.J. Blazkowicz who’s in the process of assaulting the fortress of the evil Deathshead (I cannot read that without my brain saying “Death Shed”) with the Allied army in World War II. After things don’t quite go to plan you find yourself in an asylum for 14 years, coming round in 1960 where the whole World surrendered to the Nazi war machine and they now run a very different world. Not being the type of guy who can sit around and let the injustice around him continue, B.J. sets out to find the resistance and starts a jaunt across Europe to get even with the hun. I’m making light of this a little, the game won’t mind, and although the characters are relatively comical in presentation for most of the time you see them, the story and world is pretty horrific in its context and in the heavy handed actions applied by the German regime (think of the hopeless situation implied during the whole of Resistance 3). The alternate reality portrayed would be extremely grim, and a bit too much, if things were taken too seriously. 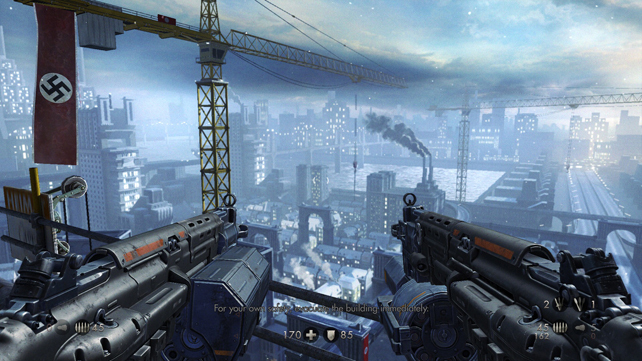 Wolfenstein is very much a return to the values of old whilst maintaining the slick presentation that we’re used to seeing from first person shooters in recent years. There are two options that stand out when you start the game up: 1. it taunts you if you choose easy difficulty, 2. if you select “Foreign” subtitles only, it translates Scottish accents. Any game that begins with blatantly poking fun at your gaming skills, then having a laugh at peoples inability to comprehend accents is going to be fun. Subtitles are not needed for any of the English speaking characters by the way, but my German is non-existent, they are very handy for that! Interestingly, translations are not supplied for the loading screens that contain German quotes, which is refreshing that the developers give the audience credit that they don’t need handholding through every aspect of the game. This is flowed through to the opening sequences that act as tutorials, but don’t interrupt the gameplay or stop the flow of the action; nice little touches that add to a smooth experience. The weapons are mostly what you’re used to, with a few nice surprises thrown in. Handguns, Assault Rifles, Shotguns and Sniper Rifles are all here, and you can upgrade each one to add a bonus ammo type or fire mode. All of these can be dual-wielded as well, and the left trigger switches from zoom to fire so that you can control your hailstorm of bullets with precision. Knives are a staple of the stealthy player, and can also be held with one in each hand, as well as being lobbed at your target. Introduced into this world is about the most useful tool you’ll ever find too – the Laser Kraftwerk. Aside from being a nod to the influencers of electronic music, it also means power station, apt for what you’ll be using it for. The device acts as both energy weapon and cutting tool to get you through thin metal grates and barriers. In theory it sounds great, and in practice it works well, though the environment traversal opportunities it offers are fairly restricted. The locations you visit are decently realised and well thought out so that they’re easy to navigate, which is useful because the map is pretty useless. If you want to feel disoriented and lost just shut your eyes and hit the touchpad then try and figure out what it’s telling you. There’s a degree of environmental destruction, cover disappears under fire so you can stop those pesky AI hiding for too long, however, as the world is created using super concrete (honestly, that’s part of the story), you can’t just blow a hole in the wall to get through. 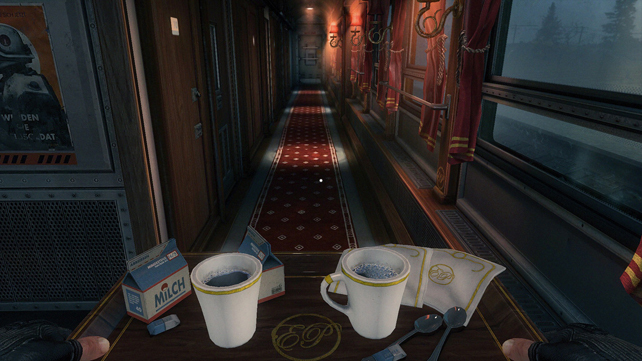 The game throws you from asylums to prisons, from Berlin to London, and from the deep ocean to the surface of the Moon. 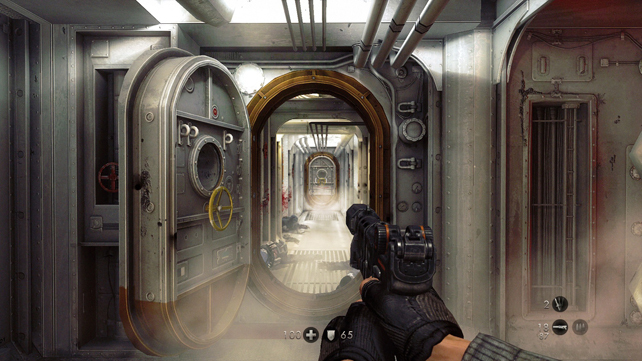 I’ve a soft spot for levels set on U-Boats, I think it stems from the Medal of Honor games, and Wolfenstein didn’t let me down. I got to shoot my way through the tight enclosed sections of one, and even got to drive a mini-submersible through a sewer system, which was a bonus. The bodies you leave in your wake as you sneak/sprint through all these wonderful places are pretty much cannon fodder with the exception of the boss battles. Every now and again you’ll come up against a super-soldaten where the technique for taking them down is just to pump more bullets in to them, though you can take out pieces of their armour and reveal weaker spots (if you don’t mind becoming a bullet sponge whilst you aim). The enemies aren’t the sharpest knives in the drawer, or even in a blunt knife graveyard, but they do what they’re meant to do in this type of game – kill you if you don’t kill them first. You can upgrade your death-dealing, which comes naturally through playing in the different styles, and, in direct contradiction to the current perception of how FPS games should be constructed, you have to pick up health and armour to keep yourself alive. Overcharging your health is useful, meaning you push yourself above the maximum limit instead of leaving unused packs lying around, and it then ticks down to your normal state. I really like this, not just because it’s how games used to be before the magical regeneration system, but because it makes you think tactically and carefully about what you’re going to do. You stop being a lazy gamer, knowing you can just duck behind a wall and wait for recovery. 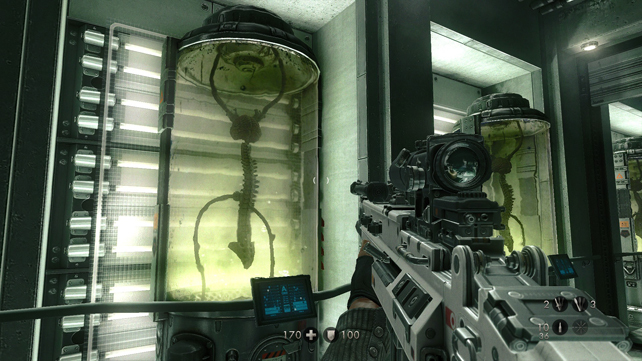 I’d prefer to automatically pick these things up though instead of having to press square each time I’m near them. As the game builds towards its climax it does start to become more serious and throws some soul searching moments at you. 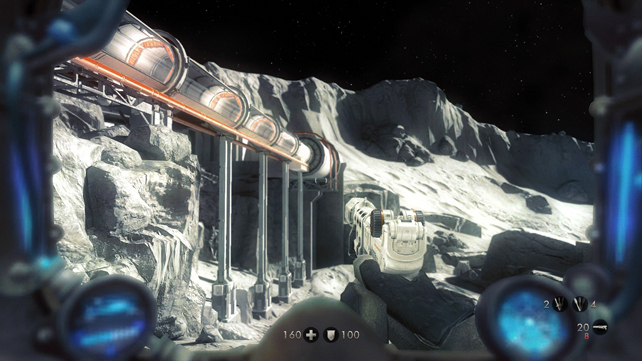 You might think that this approach is out of place whilst you’re running across the moons surface to attack the nasty space Nazis… you’d be wrong. By the time you get there you’ve become invested in the characters and the situation, no matter how ridiculous, loud and brash the game is. My two gripes with it though are that the main bad guy (Death Shed, in case you’d forgotten) isn’t present for most of the game and so your finale with him falls a bit flatter than it would with other characters you’ll have met; and B.J.’s inner monologue that starts off as wisecracks, and moves towards real feeling, is sometimes too quiet to hear. I only wish the voice activated weapon switching suffered from the same issue, every time there was a noise on the screen I ended up equipping my blade and getting shot! 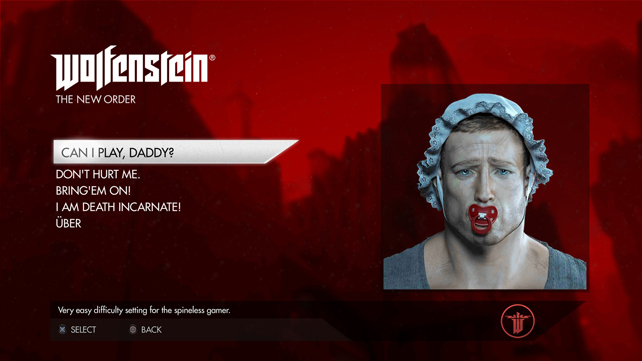 Have MachineGames and Bethesda delivered on Wolfenstein: The New Order? We’ve been excited for this for months at Codec Moments, and I’ve been very happy with the result. On paper this game sounds ludicrous and dumb, but in your hands it delivers a great single player shooter experience that you don’t get from many other titles: it’s polished, tight, well thought out, and it’s fun. So much fun. The Good: Single player focus, Freedom of stealth/action gameplay, Polished and tight. The Bad: Main villain doesn’t feature as much as he should, B.J. voice is quiet, Map is confusing.